Herein we return to highlighting denizens and persons of note that inhabit the frigid land of Alyeska. Whilst a great many good natured souls call Alyeska home, there are a few who bear dark stains. Bandits and sky pirates immediately spring to mind, the newsheets certainly help keep them front and center in people's minds. There is another group, a group infamous for its bloody reign of terror in the Alyeskan wilderness. They are a band of Windryders who call themselves the Black Talons. 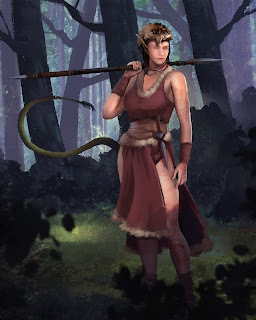 Though there have been recorded instances of clashes between Humans and Windryders, typically they have been caused by the Windryders being provoked by Humans trespassing on or desecrating land scarce to the Windryders. Other times it has been the Windryders acting out of self-defence as Humans have raided a Windryder stead. Though recently there have been attacks against outlaying settlements by a ruthless band of Windryders. They are a band of Windryders seemingly want on the destruction of Human settlements and can be easily identified by a burn mark on their left cheek. This burn mark looks like the rough shape of a bird's talons and a Windryder receives this mark when they join the band. Each member of the Black Talons has either suffered a perceived wrong committed by Humans or view Humans as invaders defiling Alyeska. They are considered outcasts by the various Windryder tribes, though that doesn't stop new members from joining. Their leader Khargi is well known for his hatred of Humans, his tribe was wiped out by a gang of sky pirates who wanted the tribe's stead and dragonhawk eggs. It was he who formed the Black Talons after finding others who'd suffered at the hands of Humans and soon started raiding remote settlements and logging camps. They only use traditional Windryder weapons like bows and spears, so they limit their attacks to raids on lightly defended settlements with the intention of destroying or killing what they can. Some younger members have advocated for the use of rifles, but Khargi has rejected by brutally maiming the most vocal supporter for using these weapons. Human characters, or groups with Humans in them, will most certainly encounter the Black Talons as enemies. Genchi characters' experiences will depend on how in favour of technology the Black Talons are in your game. Windryder characters will be mistrusted, but the Black Talons won't be openly hostile to them. Khargi's Agility, Smarts, Fighting, Riding and Shooting all increase one die. In addition he gains the Command and Block edges.